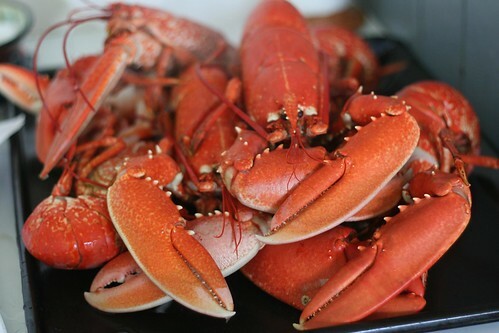 Lobster are apparently about €3 cheaper per pound at the moment due to this crazy warm summer that we have had so far according to local Ballycotton fishermen (or according to the Irish times it has something to do with the downturn in the restaurant trade). Lobster also happened to be one of the things I was most excited about cooking at the school. 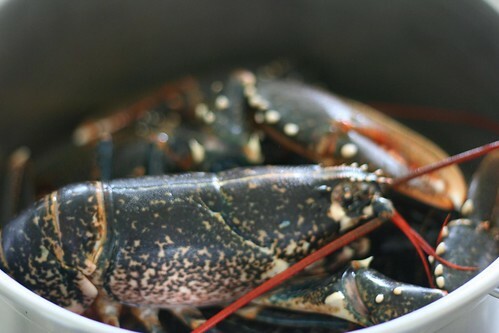 Little did I know when these lovely fellas caught my eye how much trouble they were going to make or how they would leave me cowering behind my shield of saucepan lid screaming like a little girl (along with half the rest of the kitchen lobster novices). 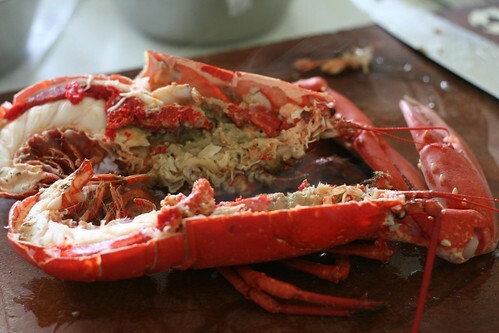 If you havent cooked lobster before you could no doubt learn a lot from my mistakes! Firstly when putting them into your saucepan they might pretend to be dead or asleep but dont believe them. Keep your fingers well away from their claws - grab them down their back. Next fill up the saucepan with cold water and for every 4 pints you use throw in 6oz of salt. This is definitely a time to keep an eye on them as the big fella in the picture below climbed out and into the sink at exactly this point. Lobsters are loud when they climb into sinks, loud and scary. The loudness gives you no indication of how fantastic tasting they will be once they are cooked, but theres still some fighting to do before they get to that point. When you have the water and salt in the pot make sure you cover it with a tight fitting lid. Then stick the pot on the heat, a low heat so that the water slowly warms up. According to the RSPCA this is the most humane way of cooking lobsters because they chill out as the water warms and then die in their sleep. The teachers in Ballymaloe also claim that they are at their most tender when cooked this way. My lobsters had a bit of a party as they fell asleep though, a bit of a loud thumping party where one of them tried to escape the pot despite the water not even being at the lukewarm stage yet. This is when I started shrieking like a girl and cowering behind the saucepan lid that had been pushed to the floor. Then when the lobster had been returned to the pot and the lid removed from my very firm grip I spent the remaining ten minutes holding the lid on the pot (you could also use a really heavy weight - like a 50kg barbell if you had one). Once they have stopped kicking and you have had a peek to see that they are turning pink then you can remove them and put them into a pot of boiling court bouillon until they are a really lovely pink colour like above. There isnt any great way of checking that they are cooked other than the pinkness all the way along their tail. Dont worry too much though because you can always take out the flesh and cook it a bit more in some butter (lots of butter if you want to be true to Ballymaloe of course). To get that meat out (something that does look like it could be a lot of hassle) you should stick your knife in right at the cross in the middle of his head and cut down towards the front of the head. 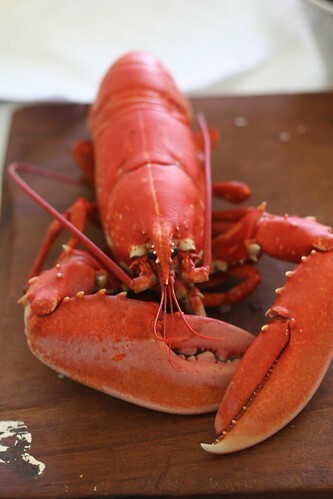 Then turn the lobster around on the chopping board and chop down in the opposite direction towards the tail. It should look something like the above but dont worry if it looks really green, that just means its not fully cooked - fry it up in a some butter until all the green turns pink. There is quite a bit of meat in the big claws too (dont worry too much about those small ones. 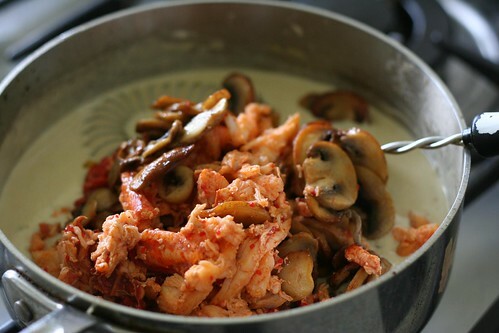 You could also put this into a nice creamy winey mushroom sauce and return to the shells as we did or just eat it from the pot dipping it into melted butter as you go. For a bloody scary looking (and sounding) creature these were fantastic, well worth a try. One way you can keep the lobsters from escaping and making so much noise is to stick them in the freezer for an hour or so before cooking them. My mother also said to stick a match up their bottoms.......chiefly, I suppose, to keep any detritus entering the water, but in fact, as one might imagine, it kept them pretty quiet too, after the initial action.